← Is There More?- A short story collection on sale now!! In the second episode of the season Regina and Emma’s new roles have been defined. Regina, who once was our villain and evil queen, is now going to take the role of “the savior”. Whereas Emma, our “savior,” at one point, is now full of darkness and intent on snuffing out the light that is left inside of her. We also see that both of them falter in taking in on these new roles. Regina doesn’t think anyone believes in her while Emma is still holding onto feelings of love for her son. We take a step back into Camelot and quickly learn where Merlin is, he is a tree. How he became a tree and why, is not answered yet. But we are told that in order to save Merlin and in turn save Emma from the darkness they need “the savior.” Regina steps forward and professes that she is “the savior,” and that she can help them. This scene gave us two important points for this season. When Regina steps forward and speaks out she prevents Emma from speaking out because she possess the dagger. 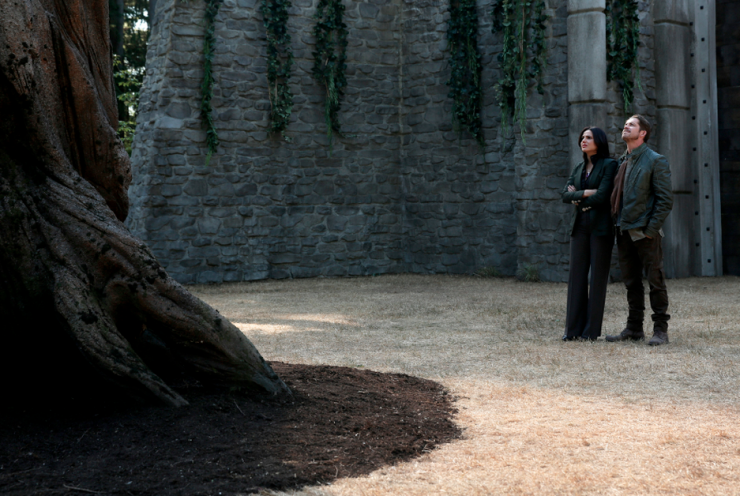 Later Emma confronts Regina about her actions and she is not happy. Emma is not oaky with anyone using the dagger to control her. She has had her first taste of her actions not being her own and she is scared. Regina tells Emma that she did it to ensure that Emma never has to use her dark powers. Regina knows what that pull will do and she wants to save Emma from ever having to fight that battle. Emma thanks her and I believe she is truly thankful for Regina helping her. But I also think this moment made Emma realize something. She is not in complete control of her life or her actions now that she does not possess the dagger. Being controlled was one of the things that Rumple could never get used to. He couldn’t even give up the dagger to Belle, who he knew would never use it to hurt him. I think Emma is going to begin to have this same struggle. There is a certain humiliation and feeling of weakness to not having complete control of your actions. This very well could be the start of her downfall. The other point that was important from this scene was Regina stepping up and taking on the role of “the savior.” Now I keep putting that term in quotation marks for a reason. The prophecy that Arthur speaks of calls for a “savior.” As far as we are aware it does not specify who that person is. What power they hold or what they can do. Arthur doesn’t bat an eyelash when Regina speaks up, meaning he had no idea who “the savior,” was going to be. This is important. Regina struggles throughout this episode because she doesn’t think anyone believes in her. She thinks everyone still sees her as a evil queen and not worthy of this new title. What she learns quickly is that she has to believe in herself for everyone else to believe in her. While Regina is learning to believe in herself and take on a new role; Emma is busy pretending that she has fully embraced her new role as The Dark One. We see her attitude with everyone but it falls away when she is talking with Henry. That moment with Henry is important. She lets down her walls and her facade of being full of evil and darkness and not caring. She tells Henry that she does not blame him. She tells him not to apologize or feel guilty. He did not fail her, the others did. For a moment before Regina walks up, we see genuine concerned and loving Emma once again. It is momentary but it shows that our light Emma is still inside of this woman. At the end of the episode we see Emma alone in her house, looking lonely. The Dark One voice that takes Rumple’s form even points it out to her. Emma has not been The Dark One for very long. She is still finding a way to live with this new version of herself. Emma has accepted a part of what it means to be the The Dark One but like Rumple she still holds light inside of her. Now Rumple had been entrenched in being The Dark One for centuries before he met Belle and let her bring out the good in him again. He had lost a lot before that point making her pulling him back extremely difficult and nearly impossible. Emma on the other hand has not been full of darkness for too long. She is still very new to this life which means pulling her back should be easier. But it is going to take everyone to do just that. At the end, The Dark One voice, tells her that there reuniting the dagger and Excalibur will be a way to extinguish the light that lives inside of Emma. She is being pulled in two directions and it is difficult for her to choose. The group has to focus their efforts on exploiting the light that is left inside of Emma. “A curse is not a curse when the inflicted wants it,” – Belle- Belle tells this to Hook after he comes to her inquiring about true love’s kiss. Hook will not let Emma go. But Belle warns him that the longer she is The Dark One the harder it will be to save her. Hook has to focus on the points of light in Emma and show her that she has not full embraced this new life. And worst of all the love that refuses to give up on us.” – Dark one voice – Here is a list of ingredients needed to bring Emma back. The group has to focus on each of these and they can save her. All of this still lives in Emma, they just have to find it and bring it back out in the open. How did Merlin become a tree? Why? Why do people who cross the town line also become trees? Emma’s doing? Some connection to the prophecy? What else did this prophecy say? Can anyone be the savior? Is it only about believing in yourself and making the right decisions? Why are the dagger and Excalibur part of one another? What does this have to do with balancing light and dark magic? Will Emma ever tell anyone about the voice that is in her head? How much light is really left in Emma? How long will Rumple live? Can they defeat the darkness in Emma without harming her? Who can pull Excalibur from the stone? Why shouldn’t it be Emma? Why is Excalibur so important to the fate of Camelot? Posted on October 5, 2015, in Once Upon a Time, Tv Shows and tagged Camelot, Emma, fiction, Henry, Hook, Once Upon a time, Regina, the dark one, The Price, the savior, tv show review. Bookmark the permalink. Leave a comment.